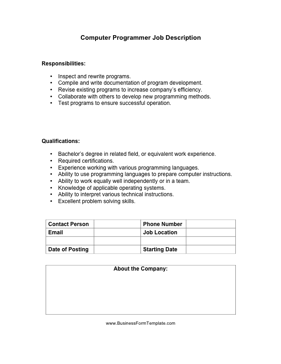 This computer programmer job description covers the qualifications and requirements to work in the programming and tech field. Compile and write documentation of program development. Revise existing programs to increase company's efficiency. Collaborate with others to develop new programming methods. Test programs to ensure successful operation. Bachelor's degree in related field, or equivalent work experience. Experience working with various programming languages. Ability to use programming languages to prepare computer instructions. Ability to work equally well independently or in a team. Knowledge of applicable operating systems. Ability to interpret various technical instructions.